You are currently browsing the tag archive for the ‘salad’ tag. 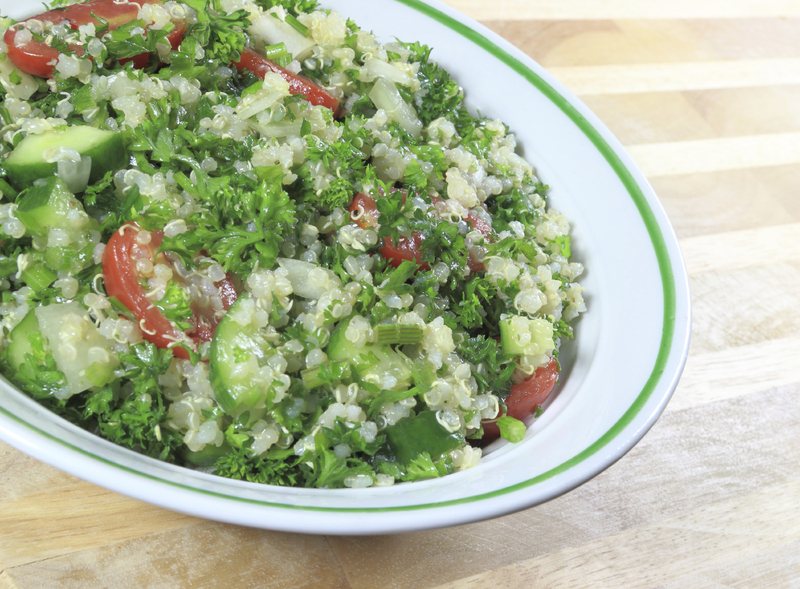 Tabouleh – an excellent salad option for a hot summer day. It’s made with fresh herbs, tomatoes, olive oil, spices and can be eaten with pita bread, or atop romaine lettuce leaves. In the Middle East, fresh grape leaves are used as a scoop. You can add any number of vegetables to tabouleh – according to taste; carrots, cucumbers, red or green onions are wonderful additions. As you can see, tomatoes are a star attraction – and since they are in season right now and delicious varieties are currently available at your farmers’ market, why not pick up a few good tomatoes and try some tabouleh tonight? If using MILLET – add 1 cup of millet and a pinch of salt to 1-3/4 cup of water; cover and bring to a boil. Reduce heat, stir, place lid on the pan and gently simmer for 20 minutes. Then stir to fluff the grains and taste. It it’s still a little crunchy, add about ¼ cup of boiling water and leave over low heat so that it will steam covered for an additional 10 minutes. If using BULGUR: place 1 cup of bulghar in a bowl and cover with 1 ½ cups of boiling water and a dash of salt. Cover bowl and set aside for 20 or 30 minutes. Fluff with a fork when all the water has been absorbed. Combine all ingredients, adding salt, pepper, lemon juice, and olive oil last. Serve immediately or chill in refrigerator for 2 hours before serving. Celebrate the summer solstice by serving yourself some delicious salad greens! Remember that long, cold winter? We thought we’d never see summer, but it’s here, and greens like lettuces, spinach and arugula are abundant. Now is a great time to find some delicious greens at your local farmers’ market. Or, better yet – pick some fresh from your very own garden. The dressing you put on your greens will really make a difference, so don’t settle for something store-bought. Mix up your own; it’s easy, and YOU control the flavors! Go to my recipes page and click on Three Salad Dressings to find easy ways to serve up your salad greens. These are the same recipes I shared at the Rt. 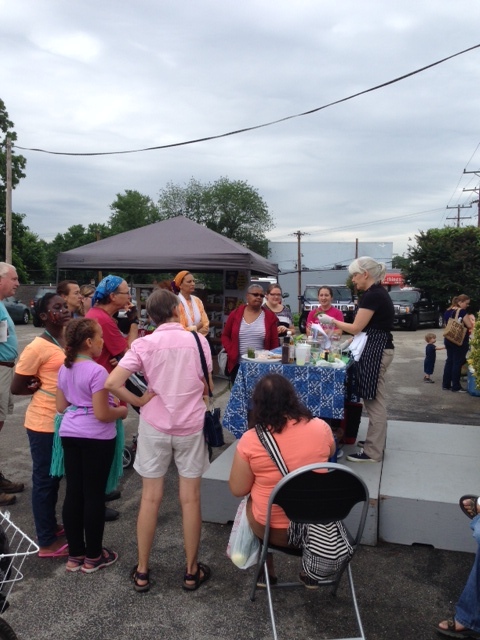 1 Farmers Market and Bazaar today, in honor of the summer solstice.